I found this outdoor restaurant near the river and stopped in for a bite. Most of the plates cost less than $1.50, so I've been happily snacking along throughout the day. 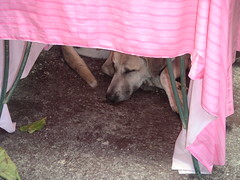 While sitting down I noticed that about half of the 30-odd tables had dogs asleep under them! While eating my meal and watching the doggies I noticed that they were all exceptionally clean, had their nails trimmed, and were FAT. It turns out that the owners of the place rescue dogs and find homes for them.